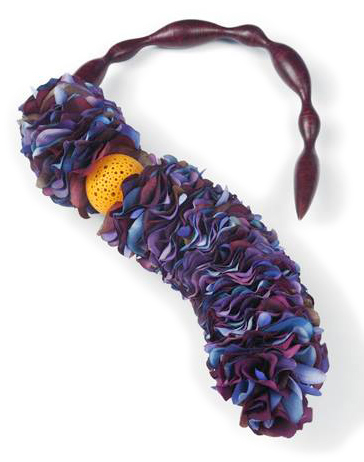 Jeff Dever’s mixed media Violet Midnight necklace made of silk flower petals, wire, polymer and a ping pong ball will be part of the 19th annual Craft Forms show at the Wayne Art Center in Wayne, Pennsylvania for the coming month. Jeff’s necklace was part of a series of jewelry he made from found materials as he developed his Immaterial lecture series. Flip through the Craft Forms catalog online to find the polymer and silver work of Carolyn Tillie in the show as well. Last month Jeff’s works were on view at the SOFA Chicago show at the Hedone Gallery where he is represented. Here’s Jeff on the first night of the show surrounded by his graceful sculptures that look like they’ve just landed at the event. More pix on Jeff’s Facebook page. Note how well Jeff wears his own work at shows! We are closing in fast on the Raise the Roof goal, hoping that our weekend readers will take us over the top. With funds coming from supporters around the globe, tabulating the amounts gets complicated and we’ll have a firm number soon. Our hearts are bursting with gratitude. This heart’s from Ron Lehocky who will add cow-shopping his list of holiday activities! Thanks to all who clicked on links until you found ones that worked. We appreciate your persistence and encourage you to keep on clicking to send the tally through the roof! “Cow shopping”….hmmmm — how does one go about choosing just the right cow, I wonder! I am udderly befuddled about how to choose a good milking cow. I will rely on the women of Nepal to make the right decision. I am utterly delighted, however, to be able to help Bishnu, the women who will be tending the cow and supporting herself from the earnings, fulfill her dream to have a home and and a purpose. At the web site http://www.acolourfuljourney.com/blog scroll down to her story ( Maya’s story) and click the link to read about her. There is also a link to the beautiful “FEELS LIKE HOME” video on the same site. The Samunnat cause is compelling and every donation counts (small or large). I am told that Bishnu is smiling and so grateful to all the generous people who helped the “Raise the Roof” Campaign. Bishnu is absolutely smiling and grateful as are we all over here. Stunned, amazed, smiling and grateful. Bishnu is excited about her cow and as one of the ladies in our cooperative has recently purchased her cow Laxmi, we are all becoming experts! We will have lots of photos to show in Malta so as many people as possibly know what a profound difference their generosity is making. From the bottom of our hearts….DHERAI DHANYABAD!